Nothing quite brings the joy of a community about like something shiny and new that everyone gets to share in the abundance of its gift. Such as a neighborhood swimming pool. The gift I present to you all is a year. Not just any ordinary year either. No no no. An ordinary year 2012 will certainly not be. For starters it’s a leap year. So not only have you been given the gift of a year but a year with a bonus day. Like a neighborhood swimming pool with a water slide. Extra fun. If you had a retirement account that was doubling in value every day the extra day could prove invaluable. It also happens to be an election year for the presidency of the United States of America as well as other key government offices certain to bring change to the global financial and political landscapes for years to come. We will finally learn the reality of what happens on the prophetic days and beyond of the Mayan calendar’s sudden end. 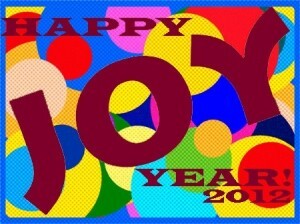 Whatever hardships have been experienced in 2011 will hopefully be healed, forgotten, or laughed about in 2012. Whatever successes enjoyed in 2011 will hopefully be shared and improved upon in 2012. And if you’re looking for something to remain constant and steady and comfortable and fun in the coming year with the intention of sharing joy with your mind, body, and soul then found what you seek have you. Mmmmm. For here is your year! Your neighborhood swimming pool. We’re all in it together. Please don’t pee in it. HAPPY JOY YEAR!